Speculation surrounding All Elite Wrestling has been building for sometimes since it was leaked that Cody and co and trademarked the term All Elite Wrestling. This cleared up the mystery surrounding the future of 'The Elite' after it became clear they were leaving ROH/NJPW and becoming free agents. It was also leaked that a new wrestling promotion was being made involving Chris Jericho, Jim Ross and the owner of the Jacksonville Jaguars Tony Khan is funding it. Jericho shot it down immediately, but it's now looking more and more likely. Before All Elite Wrestling was announced on the 1st January 2019, I was told by a source that Kenny Omega and Marty Scurll were the two main 'Elite' members who were yet to turn down their WWE deals. The source also added that 'Omega has a 3.5m downside guarantee offer with language that will grow and promote his gaming aspirations.' This corroborated separate reports from Dave Meltzer that said that Cody and The Bucks had turned down seven-figure figures from the WWE. I am told that WWE are being very active in trying to convince Omega to join, with several current WWE Superstars. Xavier Woods, AJ Styles and Seth Rollins also helping to convince 'The Cleaner' to join WWE. 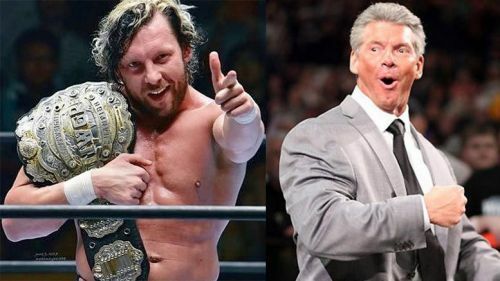 Finally, I have been told that Kenny Omega has a sit-down meeting with Vince McMahon and Triple H over the next couple of days with WWE purchasing his plane ticket from Japan. It is understood this meeting is to negotiate final terms for the contract offer and will be when Omega decides whether to sign or not. This is likely why he doesn't feature in the video reveal for All Elite Wrestling. As for Scurll, I've not heard much, but he has the rest of his Ring of Honor contract to see out anyway, but as I mentioned his WWE offer is still on the table. As is always the case with unconfirmed reports from my sources, this is something that I believe to be true, but it isn't confirmed so please approach it that way! You know, with some salt and all. All Elite Wrestling is sure to be an exciting development into the wrestling world and everyone should keep their eye out for January 8th when they make more announcements. Whether or not Marty Scurll and Kenny Omega are part of those announcements will be interesting, I guess only time will tell. Do you think Kenny Omega and Marty Scurll should stay with All Elite Wrestling? Leave your thoughts in the comments section below! Opinion: Has WWE Offered Kenny Omega Such A Big Contract? What if The Elite had invaded WWE? Will Dean Ambrose sign with AEW?